^ Warner releases ‘Rurouni Kenshin’ sequels in PHL on Aug. 20 and Sept. 24. GMA News. 2014-05-28 [2014-08-06]. ^ Mark Schilling. 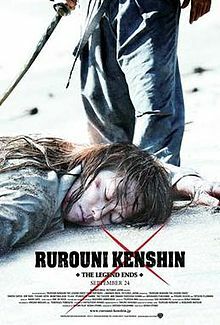 Rurouni Kenshin: Kyoto Taika-hen (Rurouni Kenshin: Kyoto Inferno). The Japan Times. 2014-08-06 [2014-12-14] （英语）. ^ 一封情书. 《神劍闖江湖：传说的最终篇》新预告 苍井优妹子好美. 游迅网. 2014-09-06 [2014-12-14] （中文（中国大陆）‎）. ^ Actor: Filming of Live-Action Rurouni Kenshin Sequels Halfway Done. 動畫新聞網. 2013-11-09 [2013-11-10]. ^ 映画 るろうに剣心 伝説の最期編. allcinema. Stingray. [October 23, 2014] （日语）. ^ Rurouni Kenshin: Densetsu no Saigo-hen (live-action movie). 動畫新聞網. 2014-09-13 [2014-12-14] （英语）. ^ New Live-Action Rurouni Kenshin Films Cast Sōjirō, Aoshi. 動畫新聞網 （英语）. ^ Live-Action Rurouni Kenshin Sequels Cast Okina, Sawagejō. 動畫新聞網. 2013-08-04 [2014-12-14] （英语）. ^ 福山雅治が「るろ剣」に“男気出演”. デイリースポーツ. 2014-07-28 [2014-07-28] （日语）. ^ 《浪客劍心》藍光&DVD商品詳情公佈. 南方網. 2014-11-27 [2014-12-14] （中文（繁體）‎）. ^ 2nd Rurouni Kenshin Sequel Film Earns 919 Million Yen in 1st Weekend. 動畫新聞網. September 17, 2014 [September 17, 2014]. ^ Japanese Box Office, October 4-5. 動畫新聞網. October 13, 2014 [October 13, 2014].